The river Ganga that the people in the plains know is very ill. It is odious. Well, what they perhaps don’t realise is that the river is not like that when she begins her journey from the Gangotri glacier. She is pristine, pure and ecstatic as she traverses through deep valleys before reaching the holy town of Haridwar in Uttarakhand. In fact, it does come as a bit of shock when one sees the emerald colour of the river. It is stunningly beautiful. But, then why the shock? The shock is on seeing the actual colour of the Ganga which is a deep, inviting green – and definitely not the blackish, foul smelling industrial broth that we see when the river passes through the cities of Kanpur, Allahabad and Varanasi before heading down towards the Bay of Bengal. The river is enchanting and inviting. One just feels like taking a dip. The water is unexpectedly cold and it takes a bit of time to adjust. Once, you have taken a dip in the river, there is no looking back. You realise why seers and mendicants head to the banks of the river Ganga in the mountains to seek peace and solitude. The Ganga in Shivpuri, a few kilometres ahead of Rishikesh, is fast flowing. The river is energetic. That is another thing you realise about the river. She is not sluggish as in the plains. She is high in energy and eager to complete its over 2,500 km long course. The clean, fast river is a sight for sore eyes. It is said that the river washes away your sins. I would now not be surprised if it could do that. It is natural to be sceptical of the river’s prowess when you see it ailing. But, when you see it in its youthful state, you realise that it is mesmerizing and does have the power to rejuvenate. 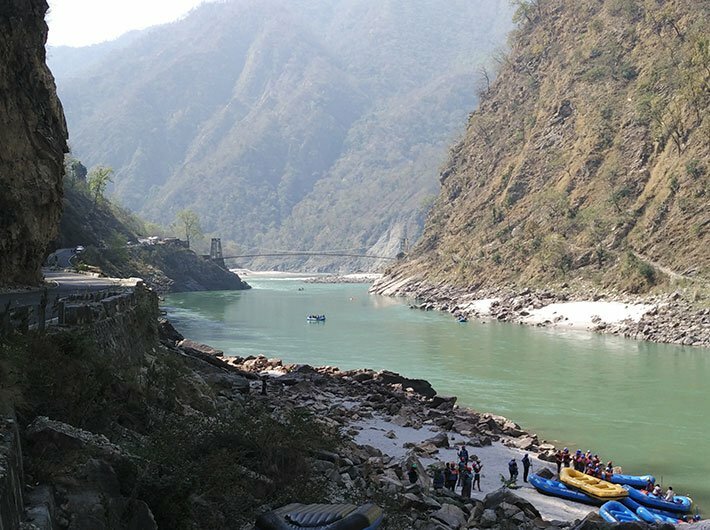 Frothing and crashing on rocks, the Ganga makes for an ideal river for rafting. One would not even think about such an adventure in the plains, simply because if you gulp in the dirty water, you are done for. However, here you know that the clean water is exceedingly good. The raft sails easily on the river, with the currents pushing it forward downriver. Along the way, come the rapids where the raft bobs and heaves. It is as if the river is telling you, don’t underestimate me. When you pass through the Grade 3 rapid called golf course, there are moments you feel that you may not make it. Yet, the rowing helps and you do clear it. There are over a dozen rapids between Shivpuri and Rishikesh, with the last one being thank god, which actually marks the end of the journey. The boat masters encourage you to jump over board when the water is placid and you are pulled back in before you reach the rapids. There is a point where people can jump off a cliff, which is about two-storey high. One needs to just overcome ones fear to do that. The Ganga, of course, is waiting for you. After the jump, you realise that instead of fearing the Ganges, it is she who was the protector and helped you come out of the deep water. The crisp, clean water of the Ganga will leave you feeling melancholic. For you will realise that she is going to get really, really dirty in no time. It is high time we quickly clean up the rest of the river to match the state she is in when she starts her journey. That is the least we can do for Ganga that has nourished millions over aeons.